This traditional oversize chair is a comfortable piece to update a corner of your living room, your study or home office room. This piece is traditional in style and comfortable with a loose back cushions and a thick seat cushion. A variety of fabric options allow you to create a chair that matches your personality and compliments your home. The 4300 Mayo Traditional Chair with Nailhead Trim by Mayo at Knight Furniture & Mattress in the Sherman, Gainesville, Texoma Texas area. Product availability may vary. Contact us for the most current availability on this product. Arm Padded rolled arms with nailhead trim options. Leg or Skirt Wood tapered back legs with carved front feet. This collection brings you stylish traditional furniture perfect for an update to your home. With a chair and ottoman set update a smaller space like an office or study while a sofa and loveseat (not shown) is perfect for a living room. 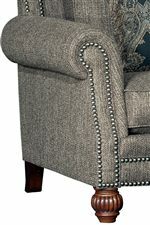 Fabric options as well as nailhead trim colors allow you to create pieces that are a reflection of your personality and style. Take pride of the space in your home with an update from this traditional style collection. The 4300 Mayo collection is a great option if you are looking for Traditional furniture in the Sherman, Gainesville, Texoma Texas area. Browse other items in the 4300 Mayo collection from Knight Furniture & Mattress in the Sherman, Gainesville, Texoma Texas area.